Dear Reader, we make this and other articles available for free online to serve those unable to afford or access the print edition of Monthly Review. If you read the magazine online and can afford a print subscription, we hope you will consider purchasing one. Please visit the MR store for subscription options. Thank you very much. —Eds. Fred Magdoff is professor emeritus of plant and soil science at the University of Vermont and a long-time commentator on political-economic topics. John Bellamy Foster is editor of Monthly Review and professor of sociology at the University of Oregon.They are coauthors of The Great Financial Crisis (2009) and What Every Environmentalist Needs to Know About Capitalism (2011)—both published by Monthly Review Press. But in a period like the present when trade is chronically stagnant what can we say of the worker’s hope if he can see no further than a continuance of the present relations of employer and employed; if the system of capital and wage-earning is to go on? More than six years after the beginning of the Great Recession in the United States, and nearly five years since it was officially declared over in this country, the core economies of the capitalist world system remain crisis-ridden. The jobs lost in the downturn in the United States have not yet been fully recovered and the economy remains sluggish. In Europe the crisis has hardly abated at all and a number of the peripheral European Union countries are in what can only be called a depression—especially Greece, Spain, and Portugal.2 The last member of the triad of advanced capitalist centers, Japan, has gone through what have been called two “lost decades” of slow growth and deflation and is attempting once again to jump-start the economy through a combination of devaluation of the yen and deficit spending. Neither Summers nor Krugman offer a theoretical or historical explanation for secular stagnation. Instead they focus simply on the liquidity trap in which interest rates approach zero—making it difficult to stimulate the economy monetarily by further lowering rates.7 Nevertheless, they are both perfectly clear about the policy implications from their standpoint. What is needed is increased spending of all kinds to get the economy moving again, initially through expanded government expenditure, but with the object of jump-starting private investment spending. In these terms not only is government deficit spending good, but so in a way is “wasteful” spending—both public and private—and even financial bubbles (insofar as these are not destabilizing for the entire system), since they can all aid in achieving faster growth. To quote Krugman: “private spending that is wholly or partially wasteful is…a good thing, unless it somehow stores up trouble for the future.”8 The way out of the crisis is then to give the whole economy an artificial stimulant of some kind—even risking further long-term problems. What is abundantly clear is that some of the foremost economic defenders of the system are now presenting the disquieting perspective that stagnation is somehow deep-seated in the contemporary capitalist economy, and that waste and financial bubbles in this context become in a sense “rational.” All of this naturally gives rise to the demand for a deeper explanation of secular stagnation and its relation to the contemporary expansion of finance. draws upon…a line of thought which originated with Michał Kalecki and attained its most complete expression in the work of Josef Steindl published in the early 1950s, Maturity and Stagnation in American Capitalism…. A simpler version appeared in Paul Baran’s and my book Monopoly Capital, begun in 1956 and published in 1966. Consequently the economy became increasingly dependent for its advance on historical stimuli external to the private-accumulation process, including state spending, economic waste, and major technological innovations (particularly those of an epoch-making character such as the automobile). In “The Crisis of American Capitalism” as well as other articles, Sweezy singled out six factors external to the normal workings of private accumulation that had helped prop up the economy in the early post-Second World War era: (1) the rise of unrivaled U.S. economic hegemony which set the stage for the expansion of world trade and capital movements, leading to the growth of multinational corporations; (2) the enormous consumer liquidity (savings) that had been built up in the United States during the war period; (3) the rebuilding of the European economies that had been shattered by the war; (4) new technologies arising out of the wartime experience, including electronics and jet aircraft; (5) the second wave of automobilization of the U.S. economy in the 1950s with the construction of the interstate highway system; and (6) the acceleration of militarization and imperialism during the Cold War, including two major regional wars in Asia. In the spring of 1980, when Sweezy was addressing “The Crisis of American Capitalism,” it was unclear that there was any immediate, short-term solution to stagnation (then referred to as stagflation because of the simultaneous occurrence of stagnation and inflation). An expansion of militarization, though it was to emerge soon after Reagan was elected with the unleashing of what was to be called the “Second Cold War,” was not itself enough to rev up the accumulation engine; while a full-scale world war of the kind that had lifted the German and U.S. economies, in particular, out of the Great Depression, was unthinkable in the nuclear age. Even a major imperial war on the scale of the Korean War or the Vietnam War seemed off the table at the time. Nevertheless, over the next several years it became clear that a sea change was taking place in the U.S. economy. A financial explosion was occurring that represented a qualitative change in the operation of the system—what Sweezy in the 1990s was to call “the financialization of the capital accumulation process.”16 The fundamental logic behind this process was clear from the standpoint of the Marxian critique of monopoly capitalism.17 Faced with a shortage of investment outlets, the surplus capital available to corporations and the wealthy increasingly flowed into the financial sector looking for speculative opportunities unrelated to the production of use values. Financial institutions found ways to absorb this increased demand for speculative outlets by supplying an alphabet soup of exotic instruments—all sorts of repackaged futures, options, derivatives, and money-market schemes, leveraged by ever-growing mountains of debt. Central banks took on the institutional role as lenders of last resort, expected to intervene quickly whenever the whole rickety system seemed to be in danger of a credit crunch or financial collapse. The new financial architecture was rapidly globalized and soon began to take on a logic of its own, dominating over production itself. To the impetus provided by the wealth effect, stimulating consumer demand among the wealthy, could be added the increase in personal debt—home mortgages, car loans, credit cards, student debt—that allowed enhanced spending in the face of stagnating real income for most workers. Debt of all types (small amounts of which are of course necessary to keep the system functioning smoothly) became one of the major supports for economic growth, increasing from about 150 percent of GDP in 1980 to over 350 percent of GDP just before the Great Recession began.20 During the same period household debt rose from about 45 percent to 95 percent of GDP. The vast expansion of debt leverage for the increase of speculative instruments, out of all proportion to the underlying “real economy,” constituted the essence of the financialization process taking place in these years. The whole argument on the dialectic of stagnation and financialization was brought together by Magdoff and Sweezy in a book entitled Stagnation and the Financial Explosion, published in 1987—the year that Reagan appointed Greenspan chair of the Federal Reserve Board.21 That same year witnessed the 1987 stock market crash, which shook the entire world economy bringing it to the brink of a global meltdown. Faced with the prospect of financial Armageddon, the Federal Reserve Board under Greenspan issued an unprecedented statement on the morning of the second day of the financial crisis indicating its “readiness as a source of liquidity to support the economic and financial system.”22 It backed this up with its power in effect to print money, and a complete meltdown was avoided. The result was the “new situation as unprecedented as the conditions from which it…emerged” of which Magdoff and Sweezy had forewarned. Although a full meltdown was avoided and financial wealth as a whole was protected—as a result of the pouring of trillions of taxpayer dollars into corporate coffers—the damage nevertheless was done. The financial system was stabilized eventually at a high level, preserving capital assets, but banks slowed down their lending and the reemergence of another massive bubble to power the economy in the face of continuing weak capital formation was thereby blocked. Monetary policy became largely ineffective in the zero interest rate (liquidity trap) climate. The upshot was that the underlying stagnation in the “real economy” came visibly to the surface, with no apparent recourse for the system aside from further financial bubbles, which were themselves stymied at present. 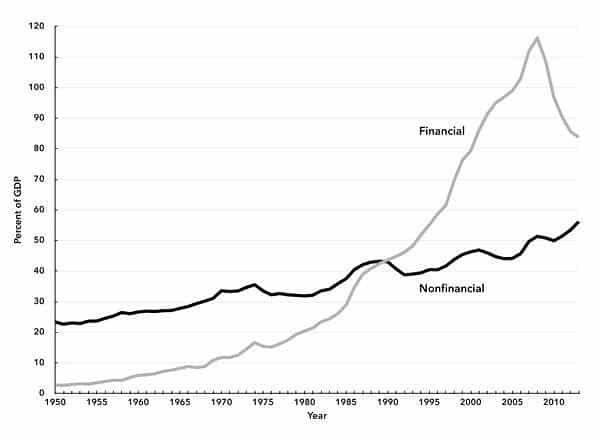 The magnitude of the great wave of financialization can be seen in Chart 1, showing the trends in nonfinancial and financial corporate debt as percentages of national income (GDP). 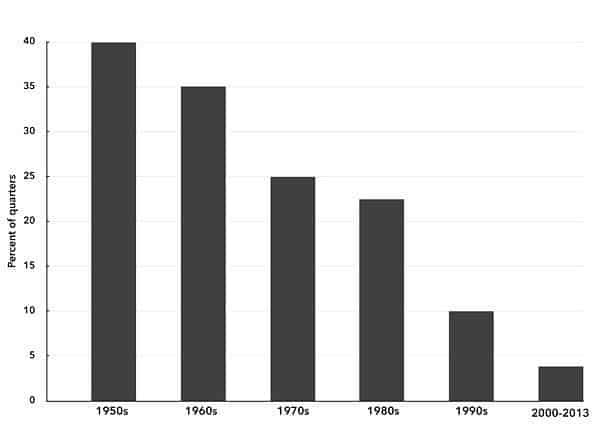 Although nonfinancial corporate debt as a percent of U.S. GDP rose significantly beginning in the 1980s, it was the skyrocketing of financial corporate debt (on the part of banks, insurance companies, pension funds, brokerage agencies, mortgage lenders, hedge funds), in particular, that was central to the huge wave of financialization of 1980 to 2007, helping to promote moderate if slowly declining long-term growth in most of the period. Over the span of less than three decades, financial corporate debt increased from about 20 percent of the GDP to an astounding 116 percent of the GDP. And it was the sharp contraction in financial debt as a share of GDP in the 2007–2009 period that singled the weakening of financialization as an available corrective to stagnation, continuing to the present day. Source: Outstanding debt of financial and corporate nonfinancial business from U.S. Federal Reserve’s Flow of Funds; GDP from St. Louis Federal Reserve FRED Database. It is this situation that lies behind what we have called a “stagnation-financialization” trap characterizing recent economic history.27 Without financial bubbles capitalist growth over the last few decades would undoubtedly have been slower. But like all bubbles they expand until they burst in the end. And when they burst stagnation looms once more. If the core of the capitalist world economy is now visibly in the grip of stagnation, with the weakening, at least for the time being, of the financialization process, it is necessary to examine more closely what this means. While financial crises have received a lot of attention in the economic literature of late, economic stagnation and its effects are little understood. From a working class viewpoint, stagnation presents itself as a tough job market and sluggish or no growth in wages and salaries for workers, with the notable exception of the upper strata of corporate officials and some professionals—as discussed in our article “The Plight of the U.S. Working Class.”30 The return of stagnation is indicated by the change in the job market. In the 1950s and ‘60s, the official U.S. unemployment rate averaged 4.6 percent, while during the period from 1970 to the present it averaged 6.4 percent. Beyond this rise in unemployment is a rise in underemployment and of the general precariousness of an increasing proportion of the workforce. Given that the tendency of the system is to enlarge the surplus (value) going to the corporations and the wealthy, an increasing concentration of income and wealth is to be expected. In fact a kind of vicious circle is generated: (1) The inability to absorb a rising surplus held by corporations and wealthy households lowers growth rates and induces stagnation. (2) The vested interests respond to the slowdown by doing everything they can to increase their shares of the social product so as to maintain the rates of return on their individual capitals. (3) This results in an even greater concentration of surplus at the top of the economic pyramid intensifying the overall problem of surplus absorption. The economic slowdown—or what some have called The Great Stagnation, a term that goes back to the early 1980s—has thus led to a much larger slice of the economic pie being appropriated by the wealthy with a much smaller slice leftover for workers.31 This is evident not only in income and wealth statistics but also in the increases in hunger, declining health, rising homelessness, burgeoning personal bankruptcies and mortgage defaults, and loss of homes affecting large portions of the population. These are very difficult times for a large segment of the working class, especially so for the large pool of un- and underemployed in the reserve army of labor. Slow recovery of jobs lost during recessions is becoming more and more of a problem, leading to what have been called “jobless recoveries” (see Table 1). Coming out of the recent recessions, the economy grows, but not fast enough to create sufficient jobs for all that want and need work. In each recovery it has taken a long time just to regain the jobs lost during the recession—a phenomenon that has worsened over the last three decades. * Lost jobs not fully recovered at time of writing. Source: U.S. Bureau of Labor Statistics (BLS), “Nonfarm Employees,” series CES0000000001, http://data.bls.gov. The same trend can be seen when comparing growth of GDP following recessions. In the first quarter century after the Second World War, triad economies rebounded quickly from recessions, which is the reason that jobs recovered so rapidly. But the economy has only slowly limped back following the last three recessions—those that began in 1990 (following the savings and loan bank crisis), 2001 (following the bursting of the dot-com stock bubble), and 2007 (following the bursting of the housing bubble). Comparing economic growth between the 1950s and ‘60s with the subsequent decades, the real GDP growth rate slows down from over 4 percent in the 1950s and ‘60s, to around 3 percent for the 1970s to ‘90s, to less than 2 percent for the 2000s. (It is worth noting that the average annual real GDP growth in the 1930s was 1.3 percent.) GDP is reported on a quarterly basis and, thus, short spurts of growth are discernable. It is therefore possible to determine that these diminished annual growth rates are not due to far more quarters of slow growth, but rather result from far fewer quarters of very high growth during which capital accumulation achieved escape velocity. High rates of real GDP growth were very common during the 1950s and ‘60s, comprising some 35 to 40 percent of the quarters during those decades, compared with 20 to 25 percent in the 1970s and 1980s, 10 percent in the 1990s, and less than 4 percent of the time during the 2000s (see Chart 2). Source: Bureau of Economic Analysis NIPA Table 1.1.2. Contributions to Percent Change in Real GDP. Personal expenditures by the public for consumer goods, services, and housing, etc. Federal, state, and local government consumption and investment spending. *Federal, state and local government consumption expenditures and gross investment. Sources: Indexes derived from Bureau of Economics National Income and Products Accounts (NIPA) Table 1.1.5 and GDP. *Of the 267 quarters, from second quarter 1947 to the fourth quarter 2013, 15 percent had <0 percent real GDP growth; 17 percent had from 0 to 1.9 percent real GDP growth; 29 percent had from 2 to 3.9 percent real GDP growth; 17 percent from 4 to 5.9 percent real GDP growth; and 22 percent were >6 percent in real GDP growth. During the entire period real GDP growth averaged 3.2 percent on an annual basis and the contributions to this of gross private domestic investment was 0.8 percent, personal consumption averaged 2.1 percent, net exports averaged -0.1 percent, government expenditures averaged 0.6 percent (of which federal spending for defense was 0.2 percent), and change in private inventories averaged 0.1 percent. Source: Calculated from Bureau of Economic Analysis NIPA Table 1.1.2 Contributions to Percent Change in Real Gross Domestic Product. 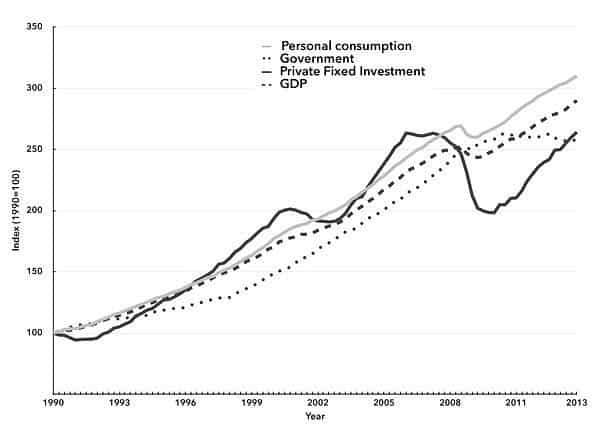 Despite the importance of both personal consumption and government spending, private investment’s contribution to the GDP growth varies the most and is most critical to future growth prospects. The fall in private investment during recessions drags down GDP growth. Conversely, rapidly increasing private investment during recoveries stimulates spurts of GDP growth. When firms do use this money, as opposed simply to piling up cash, it is frequently to pay dividends to stockholders, buy up other companies, or else to buy company stock in the hope of driving share prices up: a pure speculative endeavor. In 2013 corporations authorized $755 billion to buy back shares of stock.36 Failure to absorb the enormous economic surplus and its use instead for speculation means that the actual rate of growth of the economy slows down in relation to its potential rate of growth. To the extent that corporations do continue to invest in this kind of economic environment it often serves to displace labor and decrease their unit costs of production, increasing the overall surplus at their disposal. The capital formation that does occur under these circumstances is therefore unable to lift the economy out of its general listlessness. In light of the overall tendency to the overaccumulation of capital in which capital becomes the barrier to its own advance, and recognizing that the growth of the economy has slowed down over the last half-century, it should come as no surprise that the trend-rate of growth of investment, the motor force of the economy, has decreased dramatically during this time. The average annual rate of growth in real gross nonresidential fixed investment has plummeted from the 1960s and ‘70s to the present, especially investment in structures and equipment (Table 3). Source: Bureau of Economic Analysis NIPA Table 1.1.1. Percent Change From Preceding Period in Real GDP. Is There a Way Out? It is not at all clear how and when, if ever, the U.S. and the other mature capitalist economies can break out of the stagnation-financialization trap. An economy characterized by “secular stagnation,” Summers told the Washington Post in January 2014, “is likely to be bubble-prone.”39 This means that, lacking other external forces of propulsion, the economy tends to oscillate between outright stagnation and periods of financial exuberance associated with rampant speculation, generating moderate growth for a time until the bubble inevitably bursts and stagnation, which has been held partly in abeyance, resurfaces. New capital formation, the most dynamic portion of the economy, the one that has the largest potential influence on future growth, is in the doldrums. Corporations hesitate to add to new capacity and when they do most of what they spend, as we have seen, comes out of depreciation funds. Although a new technology or group of technologies might arise to cause a break out from stagnation, they would need to be of such import and have such economy-wide implications as to generate a large burst of self-propelling economic growth and job creation. In 2013 Apple had about 80,000 employees worldwide, Google (in its own standalone business, not including Motorola and other subsidiaries) around 40,000, and Facebook about 4,600.41 In early 2014, Facebook purchased WhatsApp, a mobile-messaging company that has fifty-five employees, for $19 billion. In fact, the computer, smart phone, and advanced robotics appear to destroy plenty of jobs (by replacing people directly or by assisting the offshoring of businesses) and many of the jobs directly created by their production are in other countries. Mass electronic retailers are also exhibiting a strong potential to generate a net loss of jobs. “According to a recent study of U.S. Census data by the Institute for Local Self-Reliance, in Washington, brick-and-mortar retailers employ forty-seven people for every ten million dollars in revenue earned; Amazon employs fourteen.”42 A University of Oxford study has estimated that, with the combination of advances in artificial intelligence and mobile robots, approximately half of all U.S. jobs could be at risk over the next few decades.43 Whatever their net effect on jobs—and at this point the effect appears to be negative and getting more so—these technological innovations have not been sufficient and of the right type to put the economy on a new rapid growth trajectory. Its success at generating net exports has been part of the explanation for the relative strength of Germany’s economy. But every country cannot become a net exporter—it is, of course, logically and mathematically impossible. With the exception of a short period in the early 1990s (coinciding with a recession), the United States since the early 1980s has been a net importer of goods and services. One temporary “answer” to stagnation, as we have seen, is the expansion once again of the financial system. But there the effects of the crisis still linger. The dominant perspective on the financial problem in the advanced capitalist states is that a period of “austerity” is needed whereby cash flows in the “real economy” are systematically redirected to the financial sector, increasing the liquidity of the latter, while simultaneously a period of slow deleveraging within finance occurs, further increasing the ratio of assets to liabilities. A major part of this overall strategy involves reducing government debt, so as to strengthen the capacity of the state to fulfill what in the eyes of the financial elites is now its primary role: as lender of last resort for firms deemed “too big to fail.” Presumably, such changes in the overall ratio of assets and liabilities will eventually set up the economy for a new period of financial expansion. Yet, such financial restructuring is a slow process and has the negative effect of worsening in many ways the overaccumulation tendencies of the system—while future bubbles are likely to be bigger and more dangerous than before. Progressives are inclined to insist that the immediate answer to these problems is financial reform, involving greater regulation of the financial system—under the erroneous supposition that the recent economic downturn had its root source in hyper-speculation and not in the weakness of the capital accumulation process itself. This fails to recognize the role that the surge of financialization played in lifting the economy from the 1980s to 2007. Financial deregulation in this period was not mainly the product of mere greed and corruption, as is sometimes supposed, nor was it based simply on faulty economic principles; rather it had as its object the further expansion of existing financial bubbles. No financial regulators wanted a major financial bubble to burst on their watch—so when the financial institutions demanded deregulation which would give them more slack and allow them to expand into new, previously restricted markets, they were given all they asked for and frequently much more. Today’s plutocratic system is one in which the rentiers have triumphed (rather being euthanized as Keynes suggested), now dominating over both economy and state.46 It is also one in which the global labor arbitrage of multinational corporations—i.e., the displacement of industry to those areas of the globe with the lowest unit labor costs, allowing imperial rent to be seized by a handful of giant firms—now rules over world production.47 Under these conditions old-fashioned Keynesian demand management—in which a full-employment economy is predicated on the growth in aggregate demand and overall profits resulting from the increased employment—has little chance of getting off the ground. State policies aimed at decreasing income inequality constitute another progressive strategy that is often justified along Keynesian lines of promoting effective demand and economic growth, but which falls prey to many of the same contradictions. Lower-income households generally spend a larger portion of their income than do the very wealthy. Thus the economy could theoretically be stimulated if money were transferred from the rich to low-income workers—through taxation and social programs or through increased wages (which would decrease the profit share going to the wealthy but not aggregate profits if the economy expands). Although an increase in the minimum wage appears to be politically feasible—and this would help an estimated 16 million workers—such an increase if implemented would be too miniscule in relation to the economy as a whole to have a discernible effect on the distribution of income, much less the stimulation of overall demand. Remedies that attempt to work through the existing order—for example through larger taxes on upper-income brackets and the allocation of these funds for social uses—are necessarily directed at very mild ameliorative reforms of the system, avoiding altogether the central problem of class-based capital accumulation. Consequently, even if adopted, they end up going nowhere—as far as the problem of surplus absorption is concerned. Needless to say, anything approximating equality of income is incompatible with the wage-profit system. Historically, in the United States such demands arose in the later, more radical part of the New Deal, which proposed an “economic bill of rights” along these lines, and in the Civil Rights Movement in the 1960s, which put forward a “Freedom Budget” in 1965, arising out of the 1963 March on Washington. Recently Paul Le Blanc and Michael Yates have sought to revive this idea in A Freedom Budget for All Americans, building on the original Freedom Budget. They advance twelve “basic objectives” that would guide a “New Freedom Budget” for our times: “(1) full employment; (2) adequate income for all who are employed; (3) a guaranteed minimum adequacy level of income for those who cannot or should not work; (4) adequate and safe housing for all; (5) health care for all; (6) educational opportunity for all; (7) [a] secure and expanded transportation infrastructure; (8) [a] secure and expanded Social Security; (9) food security for all; (10) a sustainable environment; (11) cultural freedom and enrichment for all (arts, parks, sports, recreation); and (12) reduction in the inequality of income and wealth to ensure realization of objectives.”56 This would clearly require the demilitarization of society and the dismantling of imperialist institutions. However, the relations of power today—with the state more than ever the state of the capitalist class—guarantee that no top-down initiative to promote such objectives will occur. Radical change in this direction will come primarily from the bottom and will require a struggle that must today be revolutionary in spirit. Indeed, viewed from a wider historical standpoint than that offered by the capitalist economy itself—one in which global humanity reemerges as a world-historical force—it is possible to envision revolutionary social transformations arising from mass action driven by the force of a common necessity. Such radical revolts against the system are likely to emanate initially from the global South (Toynbee’s “external proletariat”). But popular upsurges in the center (the “internal proletariat”) are also essential.58 If by means of such struggles the rules of the game were to be changed—or the game itself were to be altered—a whole new world of previously unimagined social possibilities would arise. ↩William Morris, “The Depression of Trade,” in The Unpublished Lectures of William Morris (Detroit: Wayne State University Press, 1969), 123. ↩On the Eurozone crisis see Costas Lapavitsas, Profiting Without Producing: How Finance Exploits Us All (London: Verso, 2013), 288–300. ↩Lawrence Summers, Speech to the IMF Fourteenth Annual Research Conference, November 8, 2013, http://larrysummers.com; Alvin H. Hansen, Full Recovery or Stagnation? (New York: W.W. Norton, 1938), 289; and “The Stagnation Thesis,” in American Economic Association, ed., Readings in Fiscal Policy (Homewood, IL: Richard D. Irwin, 1955), 540–57. See also John Bellamy Foster, “What Is Stagnation?” in Robert Cherry, et. al., The Imperiled Economy: Macroeconomics from a Left Perspective (New York: Union for Radical Political Economics, 1987), 59–70. On the origins of the stagnation debate in the 1930s see William E. Stoneman, A History of the Economic Analysis of the Great Depression (New York: Garland, 1979). ↩Lawrence Summers, “Why Stagnation Might Prove to be the New Normal,” Financial Times , December 5, 2013, http://ft.com. ↩Paul Krugman, “Secular Stagnation, Coalmines, Bubbles, and Larry Summers,” New York Times blog (November 16, 2013), http://krugman.blogs.nytimes.com. ↩Hansen’s theory is discussed by Krugman as if it merely emphasized demographic factors, not issues such as industrial maturity, monopoly, and inequality. Stagnation is seen by both Summers and Krugman primarily as a result of a long-term desire on the part of investors for negative interest rates, presenting a constant liquidity trap problem—an explanation that at best simply pushed the question back one step further without providing a real explanation. Krugman also points to Robert Gordon’s argument on the weakening of innovations. (See Robert Gordon, “Is U.S. Economic Growth Over? Faltering Innovation Confronts the Six Headwinds,” National Bureau of Economic Research Working Paper 18315, August 2012, http://nber.org.) In all of this the fundamental historical problem of capital accumulation is not addressed. ↩Paul M. Sweezy, “The Crisis of American Capitalism,” Monthly Review 32, no. 5 (October 1980): 2–3. ↩Sweezy, “The Crisis of American Capitalism,” 3. ↩See John Bellamy Foster and Henryk Szlajfer, eds., The Faltering Economy : The Problem of Accumulation Under Monopoly Capitalism (New York: Monthly Review Press, 1984). ↩Hansen, “The Stagnation Thesis,” 551–52; Paul M. Sweezy, Four Lectures on Marxism (New York: Monthly Review Press, 1981), 36–39. ↩Sweezy, “The Crisis of U.S. Capitalism,” 4–6; Paul M. Sweezy, “Why Stagnation?,” Monthly Review 34, no. 2 (June 1982): 7. ↩Paul A. Baran and Paul M. Sweezy, Monopoly Capital (New York: Monthly Review Press, 1966), 139–41. ↩Sweezy, “The Crisis of American Capitalism,” 6–7; Alan Greenspan, “The Great Malaise,” Challenge 23, no. 1 (March-April 1980): 37–40. ↩Paul M. Sweezy, “More (or Less) on Globalization,” Monthly Review 49, no. 4 (September 1997): 3. ↩Harry Magdoff and Sweezy had begun looking at the long-run decline in liquidity in the U.S. economy and its relation to the theory of monopoly capital as early as the mid 1960s, and carried this analysis forward in a number of prescient articles through the 1970s, even prior to what we are calling here “The Great Financialization,” which can be seen as beginning in earnest in the 1980s. On their earlier analyses of this phenomenon see Paul M. Sweezy and Harry Magdoff, The Dynamics of U.S. Capitalism (New York: Monthly Review Press, 1972) and Harry Magdoff and Paul M. Sweezy, The End of Prosperity (New York: Monthly Review Press, 1977). ↩Harry Magdoff and Paul M. Sweezy, “Production and Finance,” Monthly Review 35, no. 1 (May 1983): 1–11. ↩Magdoff and Sweezy, “Production and Finance,” 11. The concept of a wealth effect—or increases in consumption associated with increases in wealth (measured in asset values), as referred to by Magdoff and Sweezy here—has come to play a large role in accounting for the real effects of financial bubbles on growth in GDP, and for the recent housing bubble, in particular, which was seen as based on a housing wealth effect. See Dean Baker, The End of Loser Liberalism (Washington, DC: Center for Economic and Policy Research, 2009), 18; Christopher D. Carroll and Xia Zhou, “Measuring Wealth Effects Using U.S. State Data,” paper presented at Federal Reserve Board of San Francisco Conference on Empirical Macroeconomics Using Geographical Data, March 18, 2011, http://frbsf.org. ↩John Bellamy Foster and Fred Magdoff, The Great Financial Crisis (New York: Monthly Review Press, 2009), 121–22. ↩Harry Magdoff and Paul M. Sweezy, Stagnation and the Financial Explosion (New York: Monthly Review Press, 1987). ↩Federal Reserve Board statement, quoted in Harry Magdoff and Paul M. Sweezy, The Irreversible Crisis (New York: Monthly Review Press, 1988), 44–45. As Magdoff and Sweezy noted here the term “meltdown” came to be used to describe the possible effects of financial crises following the 1987 stock market crash. ↩Harry Magdoff and Paul M. Sweezy, The Irreversible Crisis (New York: Monthly Review Press, 1988), 76. A similar radical change in perspective took place in the work of Hyman Minsky in response to the 1987 Stock Market Crash, causing him to introduce his notion of “money manager capitalism” as a new perilous phase in the development of the system. See Hyman P. Minsky, “Financial Crisis and the Evolution of Capitalism: The Crash of ’87—What Does it Mean?,” in Mark Gottdiener and Nicos Komninos, eds. Capitalist Development and Crisis Theory (London: Macmillan, 1989): 391–403. ↩See John Bellamy Foster and Robert W. McChesney, The Endless Crisis (New York: Monthly Review Press, 2012), 4. ↩Jared Bernstein, “Structural Stagnation, Bubbles, and the Volcker Rule,” On the Economy blog, December 10, 2013, http://jaredbernsteinblog.com. ↩Ben S. Bernanke, “The Great Moderation,” Address to the Eastern Economic Association, February 20, 2004, http://federalreserve.gov; Thomas I. Palley, From Financial Crisis to Stagnation (Cambridge: Cambridge University Press, 2012), 132–33, 195. ↩Foster and McChesney, The Endless Crisis , 4. ↩Foster and Magdoff, The Great Financial Crisis , 99. ↩On financial inflation see Jan Toporowski, Why the World Economy Needs a Financial Crisis and Other Critical Essays on Finance and Financial Economics (London: Anthem Press, 2010), 43–61. ↩Fred Magdoff and John Bellamy Foster, “The Plight of the U.S. Working Class,” Monthly Review vol. 65, no. 8 (January 2014): 1–22. ↩The term “The Great Stagnation,” to describe the long-term slowdown in the economy was first used, to our knowledge by MIT economist Lester Thurow. See Lester C. Thurow, “The Great Stagnation,” New York Times Magazine , October 17, 1982. Although pointing to the chronic failure of conventional views to consider the possibility of stagnation, Thurow did not himself provide a theoretical explanation for this phenomenon (beyond very vague Keynesian notions), nor go back to earlier theories on secular stagnation. In contrast, Magdoff and Sweezy, from a Marxian standpoint, were already pointing to the reality that the “1970s [represented] the decade in which the Great Stagnation set in”; and that history had shown that it was impossible to overcome this through a simple Keynesian stimulus, as advocated by Thurow. See Harry Magdoff and Paul M. Sweezy, “Listen, Keynesians!,” Monthly Review 34, no. 8 (January 1983): 1–11. More important than deficit spending in stimulating the economy, Magdoff and Sweezy argued in that article, was the vast expansion of private debt, which could not, however, provide an escape from the fundamental problem. More recently, the phrase “The Great Stagnation” has gained considerable currency post-Great Recession due to its use in a similar way to Thurow’s in Tyler Cowen, The Great Stagnation (London: Penguin, 2011). ↩The role of capacity utilization in investment decisions under monopoly capitalism is theorized in Josef Steindl, Maturity and Stagnation in American Capitalism (New York: Monthly Review Press, 1976) , 10–11, 127–37. See also Foster, The Theory of Monopoly Capitalism , 107–27. ↩Richard Rubin, “Cash Abroad Rises $206 Billion as Apple to IBM Avoid Tax,” Bloomberg News , March 12, 2014, http://bloomberg.com. See also Juan Sánchez and Emircan Yurdagul, “Why Are Corporations Sitting on So Much Cash?,” Federal Reserve Board of New York, Regional Economist , January 2013, http://stlouisfed.org, and “Huge Cash Pile Puts Recovery in the Hands of the Few,” Financial Times , January 21, 2014, http://ft.com. ↩Justin Lahart, “The Next Problem: Too Much Profit,” Wall Street Journal , March 28, 2014, http://stream.wsj.com/. ↩According to the Bureau of Economic Analysis (BEA), net operating surplus is “a profits-like measure that shows business income after subtracting the costs of compensation of employees (received), taxes on production and imports less subsidies, and consumption of fixed capital (CFC) from value added, but before subtracting financing costs and business transfer payments” (BEA glossary). ↩Cardiff Garcia, “Birinyi: authorised US share buyback amount finished 2013 up 58%,” January 14, 2014) Financial Times , Alphaville blog, http://ftalphaville.ft.com. ↩Bureau of Economic Analysis NIPA Table 5.2.5. Gross and Net Domestic Investment by Major Type; Harold G. Vatter and John F. Walker, The Inevitability of Government Spending (New York: Columbia University Press, 1990), 6–22. ↩On depreciation funds and investment see Baran and Sweezy, Monopoly Capital , 99–104; Vatter and Walker, The Inevitability of Government Spending , 6–8, 113. ↩Ezra Klein, “Larry Summers on Why the Economy Is Broken—And How to Fix It,” Washington Post blog, January 14, 2014, http://washingtonpost.com/blogs. ↩Cowen, The Great Stagnation , 49–50. ↩“Apple’s 2013 Annual Report,” October 30, 2013, http://macrumors.com; Google Investor Relations, “Google Inc. Announces Third Quarter 2013 Results,” October 17, 2013, https://investor.google.com; “Facebook Will Grow Headcount Quickly in 2013,” January 30, 2013, http://techcrunch.com. ↩Aki Ito, “Your Job Taught to Machines Puts Half U.S. Work at Risk,” Bloomberg, March 12, 2014, http://bloomberg.com. ↩See Robert Pollin, et. al, Green Recovery: A Program to Create Green Jobs and Start Building a Low-Carbon Economy , Center for American Progress, September 2008, http://peri.umass.edu/green_recovery. ↩John Maynard Keynes, The General Theory of Employment, Interest and Money (London: Macmillan, 1973), 376. ↩Foster and McChesney, The Endless Crisis , 137-43; Samir Amin, Three Essays on Marx’s Value Theory (New York: Monthly Review Press, 2013), 67–76. ↩This argument was put forward forcefully in Michał Kalecki, The Last Transformation of Capitalism (New York: Monthly Review Press, 1972), 75–83. See also Paul Krugman, End This Depression Now! (New York: W.W. Norton, 2012), 94–96; and John Bellamy Foster, “Marx, Kalecki, and Socialist Strategy,” Monthly Review 64, no. 11 (April 2012): 8–12. ↩Joan Robinson, “Review of R.F. Harrod, The Trade Cycle ,” Economic Journal 46, no. 184 (December 1936): 691–93. ↩István Mészáros, Beyond Capital (New York: Monthly Review Press, 1995), 893. ↩On “the political economy of labor” versus the “political economy of property” see Karl Marx, On the First International (New York: McGraw Hill, 1973), 5–12. ↩Thomas Piketty, Capital in the Twenty-First Century (Cambridge, MA: Harvard University Press, 2014), 7–11, 336, 515–17. ↩Michał Kalecki, Selected Essays on the Dynamics of the Capitalist Economy (Cambridge: Cambridge University Press, 1971), 35–42. For a discussion of Kalecki’s argument on wealth taxation and monopolistic accumulation see John Bellamy Foster, The Theory of Monopoly Capitalism (New York: Monthly Review Press, 1986), 133–36. ↩Piketty, Capital in the Twenty-First Century , 471-92, 531-32. ↩Magdoff and Sweezy, Stagnation and the Financial Explosion , 88–90. ↩Paul Le Blanc and Michael D. Yates, A Freedom Budget for All Americans (New York: Monthly Review Press, 2013), 224–25. ↩Le Blanc and Yates, A Freedom Budget for All Americans , 232-33; Linda Bilmes and Joseph Stiglitz, The Three Trillion Dollar War: The True Cost of the Iraq Conflict (New York: W.W. Norton, 2008). ↩Arnold J. Toynbee, A Study of History , vol. 1 (Abridgement of Volumes I-VI) (Oxford: Oxford University Press, 1946), 11–13, 375-79. ↩See Fred Magdoff and John Bellamy Foster, What Every Environmentalist Needs to Know About Capitalism (New York: Monthly Review Press, 2011), 37–60. ↩Karl Marx, Capital , vol. 3 (London: Penguin, 1981), 754.